Update – 28- March-2019 – Vivo has launched the new Vivo Y91i – the latest addition to the affordable phone in the Y Series. The Y91i is available in the retail market for Rs. 7,990 for the 16 GB storage version whereas the 32 GB storage variant costs Rs. 8490. You can buy it in the fusion black or the dark navy blue colors. The Y91i comes with a large 6.2 Inch Display with HD+ (1520*720) pixels resolution and has a 19:9 aspect ratio. The phone comes with an In-Cell display panel but doesn’t have Corning Gorilla Glass protection. Powering the device is the Helio P22 Processor (Octa-Core) and there is 2 GB of Ram. The Ram looks low for the price segment as most phones in this range offers at least 3 GB of memory. Aforementioned, it has 16/32 GB storage which is expandable using micro-sd card. Further, it comes with the Android Oreo 8.1 along with the Funtouch Os 4.5. For imaging, there is a 13 Megapixel single rear camera with f/2.2 aperture and a LED Flash. Besides, there is a 5 Megapixel selfie camera with f/1.8 aperture and comes with beautification mode to enhance the photos. The phone has micro-usb port, 3.5mm headphone jack and all the standard connectivity options such as 4G VOLTE, Bluetooth, WIFI. Lastly, it comes with a large 4030 mAH capacity battery which is sufficient to last all day with ease. The Y91i is an average option considering the Specs and price, you can get the Realme 3 or the Redmi Note 7 or even the Zenfone Max M2 or Max Pro M2 in the similar price range for a better overall experience. If You are buying in retail on EMI, then can consider the Vivo Y91i, else you have plenty of choices online. Update – 26/11/2018 – If you are looking for affordable Vivo Y Series smartphones, here are the top latest phones launched by brand in India. Vivo has launched the new Y95 on Sunday (25th November 2018) for the retail/online market. The smartphone is available for Rs. 16,990 and you can get Bajaj Finserve finance offers to buy the device on EMI. The Y95 is the first smartphone to come with the Qualcomm Snapdragon 439 Octa-Core Processor. It is the first Qualcomm processor to come with 12 Nm Process unlike older Processors like 430/435/450 built on 14 Nm Process. The new Snapdragon 439 has 8 Cortex A53 cores with a maximum clock speed of 2.0 GHz and comes with the Adreno 505 GPU. The performance from Snapdragon 439 is similar to the Snapdragon 450. The phone has got 64 GB internal storage and there is 4 GB Ram to ensure that it works flawlessly. The storage is expandable using the micro-sd card. The Vivo Y95 is a copy of Oppo F9 or the F9 Pro and comes with the waterdrop notch display. The back cover is made from polycarbonate and it comes in two glossy colors – starry night, and the Nebula Purple. The phone boasts of an impressive Halo Full View Display with 88% screen to body ratio and comes with minimum bezels. Further, the 6.22 Inch display has a 19:9 aspect ratio and comes with HD+ (720×1520 pixels) resolution. The phone weighs 164 grams and has a thickness of 8.3 mm. (Adequate and comfortable to hold). Another highlight of the device is the 20 Megapixel front selfie camera that comes with a f/2.0 aperture lens and has AI support. You can click portrait shots and even use AI stickers with the Y95. On the other hand, there are Dual Rear cameras – 13 MP + 2MP. The main rear camera comes with f/2.2 aperture and the secondary camera has a f/2.4 aperture. Considering the camera has small aperture the low light performance of the device may not be as good as rivals such as Redmi Note 6 Pro or the Huawei Honor 8X. The battery is large, 4030 mAH, and it can easily last all day with ease. The Y95 runs on the Funtouch OS version 4.5 and comes with the Android Oreo 8.1 as base OS. Vivo has not shared if the device offers fast charging support or if they will update the OS to Android 9.0 Pie. The device has a micro-USB port and comes with USB OTG support as well. You can listen to music using the 3.5 mm headphone jack and there are features such as Fingerprint Scanner and face unlocking. Lastly, you can use Dual Nano Sims with the Y95 and it comes with 4G VOLTE support. Hmm, if you are a Vivo fan and want a device on EMI using a financing service it may be an option for you. However, there are several other phones in this price range like Redmi Note 6 Pro, Honor 8X, Oppo Realme 2 Pro, Moto One Power, Zenfone Max Pro M1 that I would strongly suggest to consider. Vivo is becoming aggressive in India with new back to back phone launches to take on the rivals. The Chinese company recently launched the Vivo X21 with an in-display fingerprint scanner in India, and now they are have launched a new mid-range phone for the masses. The recently launched Vivo Y83 comes with all the new trendy features and is already available offline and will also sell on online stores such as Flipkart. I checked the phone yesterday in the retail market, the MRP for the phone is Rs. 14,999 but with some cool launch offers it was available for Rs. 14,000 from some of the top retail stores. Notably, the phone was launched in China in the last week, and the company has brought it to India within a week of China launch. Mr. Jerome Chen, CMO Vivo India said at the launch, ” We are pleased to introduce the new Y83 which comes with an outstanding performance and superior camera capabilities at an affordable price”. Without further ado, let’s check what’s new Y83 has to offer to the Vivo fans in India. For starters, the Vivo Y83 comes with a Bezel-less display with 19:9 aspect ratio, and at the top of the screen, there is a notch that is not too wide or deep. But it is there, and you will notice it. The phone comes with a polycarbonate build and has a thickness of 7.7 mm and weighs 150 grams. There is a fingerprint scanner at the back of the phone that unlocks it swiftly. The front side is mostly screen, and the device boasts an 83% screen to body ratio. There is a large 6.22 Inch IPS LCD Panel that comes with 1520*720 pixels and has 270 PPI. It is not the highest resolution display in this price range, a lot of phones like the Redmi Note 5 Pro or the Zenfone Max Pro M1 or even the new Moto G6 offers a superior FHD+ resolution. Powering the mobile is the Helio P22 Processor that comes with Octa-Core architecture and has 2.0 GHz maximum clock speed. Additionally, there is PowerVR GE8320 GPU that is good for playing games and doing graphics-intensive tasks. Furthermore, the Helio P22 is made from 12 Nm manufacturing process and is an energy efficient processor that offers similar performance to Snapdragon 625 (Redmi Note 5) or the Hisilicon 659 (Honor 7X). What’s more, it comes with 4 GB Ram, and there is 32 GB internal storage that is expandable up to 256 GB. It boots on the Android Oreo 8.1 out of the box and comes with Vivo’s custom Funtouch OS 4.1. There are some software enhancements such as the Game Mode 2.0, Split 3.0 and App clone to improve the user experience. The Y83 comes with single rear and single front camera despite most of the manufacturers are offering Dual camera phones in the 15k price range. The rear camera has a 13 Megapixel lens that comes with f/2.2 aperture and has phase detection autofocus and LED flash. Additionally, it comes with HDR, Panorama, touch focus and support for 1080P videos at 30 FPS. At the front, it comes with an 8-megapixel selfie camera that has a f/2.2 aperture. Also, the Front camera support Face 2.0 that enables it to offer face unlocking feature, and it even comes with the AI Beautify and portrait mode for taking selfies with background blur. The phone comes with a decent battery capacity – 3260 mAH and it is not clear whether it supports fast charging or comes with a normal charger out of the box. There are basic connectivity options such as Micro-USB port, Dual SIm, USB OTG, WIFI and Bluetooth 4.2. For a price tag of Rs. 14,999 the Vivo Y83 seems a bit expensive but is still much better in comparison to the phones from Samsung and more importantly from some of Vivo’s earlier offerings. The performance may not be top notch as the Helio P22 is no match for the Helio P60 (Oppo RealME 1) or the Snapdragon 636 used in RN5 Pro or Asus Zenfone Max Pro M1. There are some positives like the latest OS and decent battery life. The display seems decent, but an FHD+ resolution is desirable. The new Vivo phone is a mixed bag, however for a slightly lower price may do well in the retail segment. 10 Best High-end Smartphones 30K, 40K, 50K India. 10 Top Mobiles Under Rs 10000. 10 Top Mobiles Under Rs. 25000 In India. Vivo is launching a new smartphone in the Indian market called Vivo Y69. The key highlight of the mobile is that it comes with a 16 MP Selfie camera. Notably, you can purchase it online as well as offline. The 16 Megapixel front selfie camera comes with a moonlight glow flash to click better selfies in the low light conditions. The camera comes with a Samsung S5K3P3ST sensor and has a f/2.0 aperture. Also, it offers Bokeh, a group selfie, and live photo effects. The design for the smartphone looks very similar to the other Vivo phones – Vivo V5s and Vivo V5s Plus. Recently, Vivo teased that they are going to launch a premium Vivo V7+ in the Indian market with a Bezel-less display. The front side has a home button which comes with a fingerprint scanner. The mobile has a 5.5 Inch HD Display (1280*720) pixels. Also, there is a 2.5D curved glass coating on top of the display to make it more aesthetic. Additionally, the display is protected by the Corning Gorilla Glass 3. Further, it comes with metallic back cover and has an iPhone 7 like antenna design. There is a single camera at the back with 13 Megapixel (Samsung S5K3L8 sensor) resolution, f/2.2 aperture, Dual Led Flash and Autofocus system. Powering the mobile is a Mediatek 6750 processors with a clock speed of 1.5 GHz and it even has the Mali T860 MP2 GPU. We have 3 GB of Ram and there is 32 GB internal storage. The storage is user expandable and comes with Micro-sd card slot to expand it to 256 GB. The Dual Sim phone comes with support for 4G LTE as well as VOLTE apart from the native connectivity options like 3G/2G and Wifi. There is a 3000 mAH capacity battery that is sufficient to run the device all day without the need for charging again. Furthermore, it runs on the Android Nougat 7 along with the fun touch OS 3.2 and offers good user experience with the latest OS from Google. Also, it is not very bulky, weighs 163 grams and has a thickness of 7.7 mm. The Vivo Y69 will be available in matte black as well as Gold color variants in India. It costs Rs. 14,999 and can be bought from Flipkart, Amazon or in retail stores from 1st September 2017. It competes with the Oppo A57 ( another high selling selfie phone) in the market that costs Rs. 14,999. Besides, Gionee has recently launched the Gionee A1 Lite in India with 20 MP selfie camera priced at Rs. 14,999. Vivo has launched a new Vivo smartphone with 16 Megapixel front selfie camera priced at Rs. 14,980 in the Indian market. The smartphone is already listed on the Vivo’s official website and will be available for purchase both online as well as Offline. Interestingly some days back their arch rival Oppo launched a similar smartphone with 16 Mega Pixel camera in the market priced at Rs. 14,999. The Vivo Y66is a direct competitor to the Oppo A57 and Vivo has simply matched the cheaper offering from Oppo to keep hold of their market share. Both Vivo and Oppo are betting big on the selfie lovers and launching lot of new selfie camera smartphones in the Indian market. 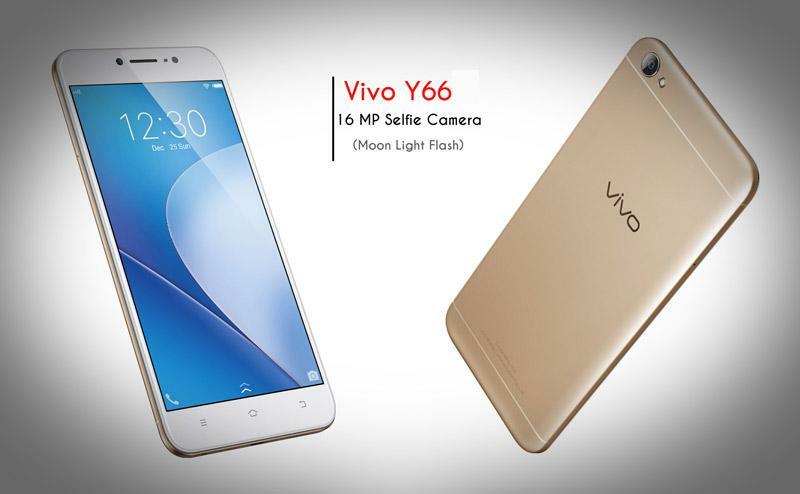 The VivoY66 comes with a 16 Mega Pixel front selfie camera which is the highlight of the smartphone and it is paired with a front camera flash which allows you to take selfies in low light conditions. Vivo calls it a moonlight flash as it creates a soft glow on your face compared to the hard light by some of the camera flash you get on other phones. I usually don’t like any images with flash it is always better to use natural light if possible for better images. The VivoY66 comes with the f/2.0 aperture lens for the front camera and is loaded with features like beautifying, offers gender detection, mirror selfie, and palm detection. There is also a 13 Megapixel rear camera which comes with f/2.0 aperture and Auto-focus camera. The smartphone comes with an un-named processor, it is an Octa-Core processor which Vivo has not even clarified on the official launch info page. We don’t expect Vivo to offer something like a Snapdragon 625 in this price range most probably it is a MediaTek 6750 or the Snapdragon 430 Soc. Oppo has used a Snapdragon 435 Processor in their Oppo A57 smartphone. There is 3 GB of Ram in the device and it comes with 32 GB of internal storage. The Vivo Y66 has the option to expand the storage to 256 GB using the hybrid sim card tray. The mobile comes with a 5.5 Inch Display and has HD Screen resolution. The HD (1280*720) pixels display offers 267 PPi screen which is a bit less considering most rivals are offering an FHD display. The consolation is that the display comes with a 2.5D curved glass. The smartphone design is similar to the Vivo V5 or their numerous other phones, there are no radical changes here. The metallic build and front white panel with capacitive off-screen touch keys are present. If you are looking for a fingerprint scanner on this 15K phone there is none, Vivo are you serious, everyone wants a fingerprint scanner. People who click selfies also want a fingerprint scanner. Intex gives it in budget phones (Rs. 4000) – Intex Cloud Scan. The smartphone comes with usual thin frame measuring 7.6 mm and it weighs 146 grams. It will be available in Crown Gold and matte black colors. The Y66 runs on the Vivo’s Funtouch OS 3.0 along with the Android Marshmallow 6.0. The Vivo Y66 has a 3000 mAH capacity battery which is not too large but again Vivo focuses more on the Aesthetic and thinness. 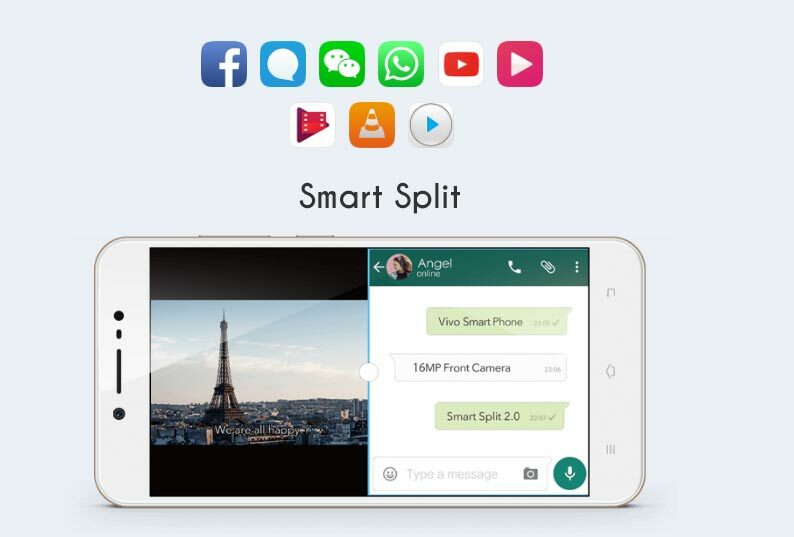 There are some special features like the Smart Split 2.0 which offers uninterrupted entertainment. If you are watching a video you can use half of the screen to reply. Usually, I would pause a video if there is something that important to revert too, else things can wait let me enjoy the video first. There is also a reading mode which you can enable to lessen the effect of blue light while reading. 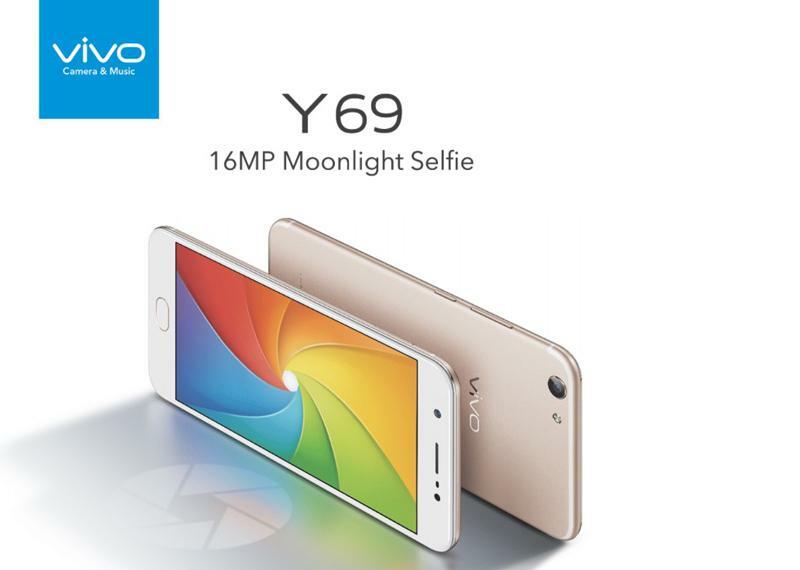 The Vivo Y66 rivals the Oppo A57 and caters to the need of selfie lovers who would like to use it for sharing selfies on the social media. But without a processor name and model, it is difficult to make a comment on how good this will be in terms of performance. And missing on the Fingerprint scanner in 2017 could be a deal breaker for many buyers. Vivo has earlier launched the Vivo V5 and the Vivo V5s, both the mobiles come with a selfie camera to entice the selfie lovers. Vivo has launched a new entry-level smartphone with 4G Volte support. It is part of the Y series and available at a price of ₹6,999. The Vivo Y21L is available online as well as offline through the extensive retail network. Gionee and Vivo are the two Chinese brands not bitten by the online sales bug. In fact, they are more focused on retail expansion. Let’s get into details of the Vivo Y21L and what it has to offer to buyers. For starters, It comes with the Android Lollipop 5.1 with Funtouch OS 2.5. Moreover, Vivo has added some cool UI features to enhance the user experience. Vivo Y21L 4G even has gesture support such as Smart Wake. You can write C on the screen to open the camera app, swipe M for music and henceforth. Not only the screen but also the buttons have various functions such as Smart Click. Press the volume down button it’ll bring up your predefined apps from a locked screen. You can use default apps such as Notes, Clock, Camera along with Third-party apps such as WhatsApp. Further, there is gesture support for the camera functions. There is a Voice capture feature that automatically takes a selfie when you say Cheese. Additionally, there is Palm Capture, which allows you to click photos by just waving your palm. Vivo’s Funtouch OS has some fun features that many users would like. Next, the design of Vivo Y21L 4G looks similar to the last gen, Vivo Y21, and Vivo Y22. The phone looks basic with a poly-plastic back cover and a no-frills front side. The back of the phone has an exquisite varnish coating that merges seamlessly with the chrome plated edges. Further, it sports a 4.5-inch FWVGA (854×480) display. Also, it has off-screen navigation buttons with no back-light. 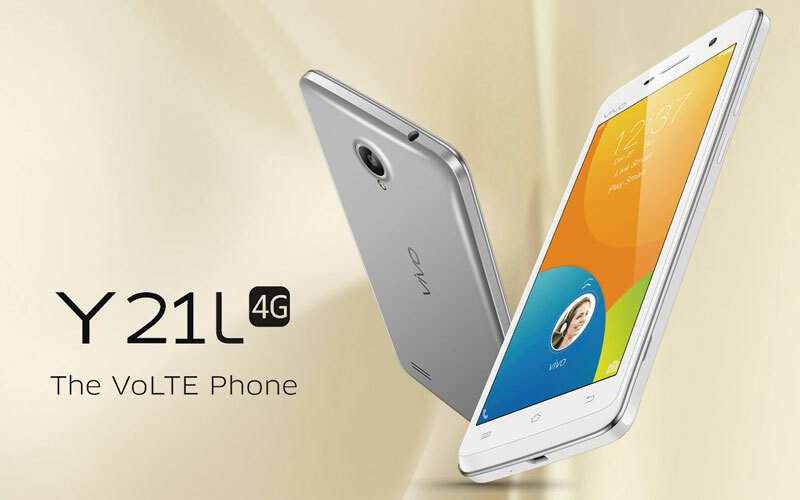 The Y21L runs on Quad-Core, 64-Bit, Qualcomm Snapdragon 410 chipset along with 1 GB of ram. It offers 16 GB of internal storage with an expandability option up to 128 Gb. Moreover, the phones come with a 2000 mAh capacity battery which is mediocre considering 4G usage consumes a lot of battery. The battery may not last all day on a single charge. Sadly, the phone disappoints in the camera department by offering 5 MP rear camera and a worthless 2 MP front camera. There is nothing much to write home about the camera prowess, apart from it being a mediocre setup. Y21L also offers basic connectivity options such as WiFi, 3G, 4G/LTE, GPS, GPRS, Bluetooth, proximity sensor, accelerometer along with USB OTG. Lastly, the smartphone is not sleek in spite of the mediocre battery size. It measures at 130.7×66.4×9.2mm and weighs 145 grams. The phone is available in Grey and White colors. It is priced at ₹7,490 that makes it compete with Xiaomi Redmi 3S, Lenovo Vibe K5, and the Coolpad Note 3 lite. Vivo has set up shop in India and is also making smartphones in the Indian manufacturing plant located at Greater Noida(northern India). The smartphone Y51L is assembled in India though parts are sourced from other countries. 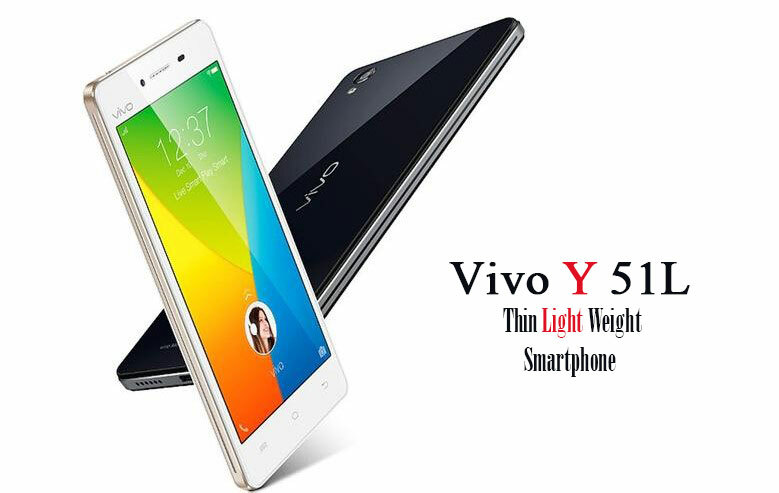 The Vivo Y51L is quite similar to the existing model Vivo Y51 which was launched in late 2015 by Vivo. The new Vivo Y51L is priced at Rs. 11980 in the Indian market and will be available for sale online and retail. Vivo is one of the Chinese companies which has invested in expanding the retail network in India and has the presence in most of the smaller towns. The availability of retail support and wide network of service centers has helped the brand grow in the Indian market. It competes with the likes of Lenovo and Gionee which also has a strong presence in the Indian market. Vivo Y51L comes with a black gloss cover and has a thin profile measuring 7.52 mm and looks great with the metal edge frame around the poly plastic body. The smartphone is meant for buyers looking for a thin device and good looks. The smartphone has a 7.52 mm thickness and weighs 157 grams. The Vivo Y51L clearly is not intended to battle against the specs monsters and would appeal to buyers looking for a thin great looking mobile device. The Vivo Y51L comes with the Qualcomm Snapdragon 410 processor clocked at 1.2 GHz. The processor is accompanied by Adreno 306 GPU which is okay for all the gaming needs. The Vivo Y51L comes with 2 GB RAM which is essential for multitasking and gaming. Many competitors have started offering 3 GB Ram in this price range now (Lenovo K4 Note). The smartphone comes with a 5-inch display and has a resolution of 960*540 which is also lower than HD resolution found in competing models. The smartphone runs on Android Lollipop OS along with the Fun touch OS version 2.5. The Vivo Y51L has dual sim support and also supports 4G LTE bands in India. The smartphone comes with 16 GB of internal storage and it can be expanded to 128 GB using a micro-sd card. The smartphone comes with 8 MP rear camera which is capable of recording Full HD videos and there is a 5 Mega Pixel front camera for clicking selfies. The Vivo Y51L comes with 2350 mAH battery capacity which is not too high considering most smartphones are coming with 3000 mAH battery capacity in this segment. Vivo has today launched a new smartphone in the budget segment named as Vivo Y55L. The Vivo Y55L is gorgeous looking smartphone and resembles the Apple iPhone 6s. The smartphone has white front and comes with 5.2 inch HD display. The display has 272 PPi and has 2.5 D curve glass making it more aesthetic. The Vivo Y55L has 7.5 mm thickness compared to 6.99 on iPhone 6s. The smartphone is powered by the latest Octa-Core Qualcomm Snapdragon 430 64-Bit processor clocked at 1.4 GHz along with the Adreno 505 GPU. There is 2 GB of ram for multitasking and the internal storage is 16 GB. The internal storage can be expanded to 128 GB using the micro-sd card. The Vivo Y55L runs on Fun-touch OS 2.6 and base OS is Android Marshmallow 6.0. The smartphone comes with nifty features like a split screen mode and offers protection from harmful blue light for a convivial reading experience. The Vivo Y55L has an 8-megapixel rear camera which comes with dedicated flash and Auto-focus support. There is a 5-megapixel front camera for clicking selfies. The Vivo Y55L is powered by a 2650 mAH battery capacity which is reasonable considering 5.2-inch screen size and a thinner build. The smartphone weighs 142 grams. The Vivo Y55L offers dual sim 4G LTE and VOLTE support and it will work with Idea, Airtel, Vodafone and Reliance JIO sim. The smartphone comes with support for USB OTG and has all standard connectivity options like 3G / 2G / Wifi & Bluetooth. The VivoY55L is priced at Rs 11980 in the market and will go on sale starting 13th October in retail stores as well as on Snapdeal and Flipkart. Next articleLow Price Android Go Smartphones – Redmi Go Launches for Rs 4499 – Worth it?